Focus in this year’s Nanyuki Rally will be the much hyped battle pitting ‘Flying Finn’ Tapio Laukkanen against multiple former Safari and KNRC champion Carl ‘Flash’ Tundo . Tundo’s new car has been the talk of town and it will be interesting to see how the star driver performs against Laukkanen. Tundo unveiled his new Ford Fiesta Proto in Wundanyi last month but failed to survive the tricky terrain when his car caught fire. Laukkanen has cleared the ground with all the big guns of KNRC over the past two seasons whenever he has had a good run, but Tundo’s new machine seems to be the answer to his longstanding dominance. There has been some good humored rivalry in the racing fraternity with fans bantering over who will come out tops. But whatever is up the sleeves of the two will be known today (Saturday) when the cream of the country’s best converge in Laikipia County. Among the most successful drivers in the Nanyuki Rally Group-organized event are Baldev Chager and Ian Duncan who will both be driving Mitsubishi Evolution 10. Duncan has won the Nanyuki diadem twice in succession in 2000 and 2001. 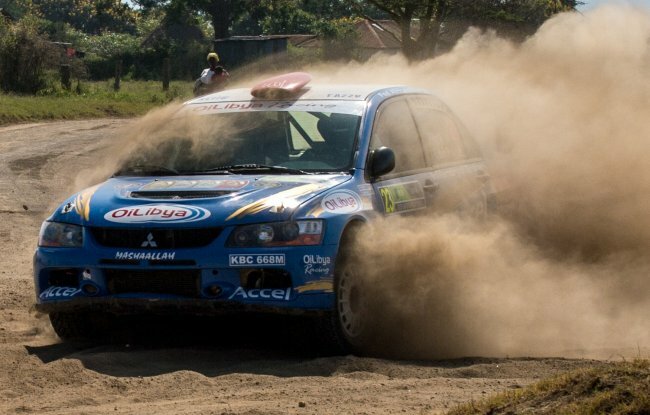 Chager won back to back titles in Nanyuki in 1995 and 1996 when the event counted towards the Clubman rally championship. He repeated his back to back feat in 2007 and 2008 in the KNRC. Nanyuki joined the KNRC in 1998, the same year when Jonathan Toroitich emerged the winner in a Toyota Celica 2000cc machine. Meanwhile, the hills around Loldaiga near Timau and Lengetia in Naro Moru will today (Saturday) reverberate with the roar of turbocharged and normally aspirated machines when the second half of the 2016 Kenya National Rally Championship gets underway in Laikipia County. Nanyuki Rally returns to the eight leg series since 2014 when defending champion Jaspreet Chatthe emerged the winner. After a rigorous reconnaissance on the route course on Friday, three stages lie in the waiting for crews on 100% private land stages. The rally will start from KCB Nanyuki branch at 7a.m. after which they will tackle a 32km transport road section through to the 50.60km Loldaiga. The finish will be at Batian View which will also be the venue for the service park, rally headquarters and the designated viewing point for spectators. Main class: 1=Jassi Chatthe 79 1=Tapio Laukannen 79, 3. Ian Duncan 62, 4. Rajbir Rai 61, 5.Baldev Chager 37, 6=Carl Tundo 33 6=Onkar Rai 33 6=Manvir Baryan 33. Classic Class: 1. Jonathan Somen 25, 2. Ramesh Vishram 21, 3. Dinesh Sachania 18. Group N Class: 1. Ian Duncan 88, 2. Baldev Chager 46, 3. Mahesh Halai 40. 2WD Class: 1. Alex Lairangi 80, 2. Eric Bengi 75, 3. Leonardo Varese 68, 4. Sammy Nyorri 39, 5. Gurmit Thethy 15 . Division 1 Class: 1. Onkar Rai 84, 2. Asad Khan "Kalulu" 48, 3. Farhaaz Khan 47. Division 2 Class: 1. Mahesh Halai 53, 2. Eric Bengi 46, 3. Adil Mirza 45. Division 3 Class: 1. Natasha Tundo 9, 2. Chandu Devji 66, 3. Edward Maina 50.